ARS NOVA Copenhagen and Paul Hillier here present the third recording in their critically acclaimed series devoted to the narrative works (Historia) of Heinrich Schütz (1585-1672). The Danish vocal ensemble thus celebrate Denmark's proud connection with this German masterwho was appointed Kapellmeister to King Christian IV and worked at the Danish court for two periods over the course of eleven years. 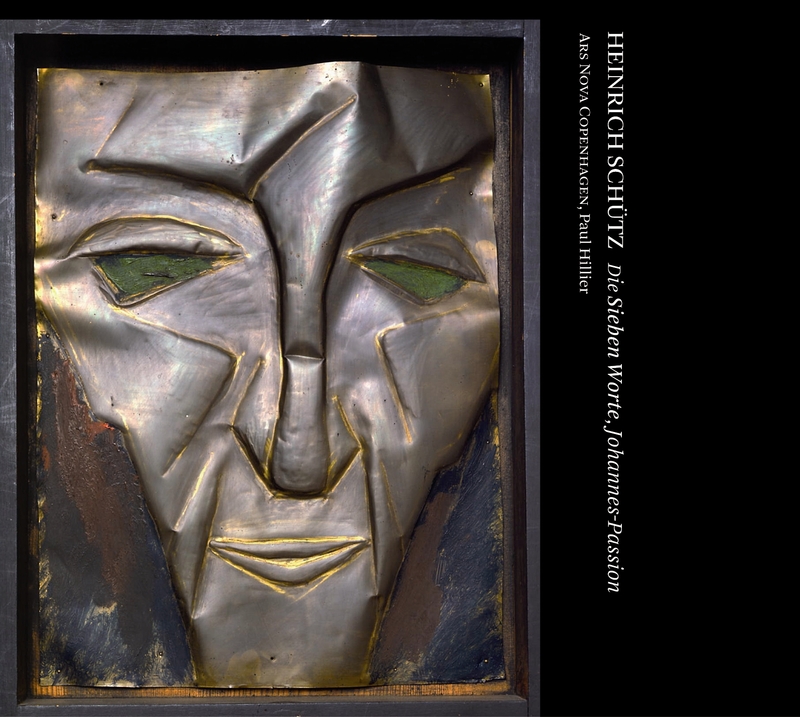 The cover illustrations show reliefs in beaten metal by Karl Schmidt-Rottluff (1884-1976), a member of the Die Brücke group founded in 1905 in Dresden - a city with which Schütz himself was closely associated. "I det store og svimlende atmosfæriske kirkerum blander de ligefremme stemmer sig til et væv af dybt interessante linjer." "Man kan ikke forestille sig noget mere ærligt og ægte...Ingen kan gøre det bedre end Ars Nova Copenhagen." "Det er flot at Dacapo kan udgive denne serie med et dansk ensemble, der kan skabe en så sublim oplevelse." "Technisch, intonatorisch und klanglich wird zweifellos ein hohes Niveau geboten. Auch die beteiligten Instrumente unterstreichen das. Sie formen in der 'Symphonia' eine sehr schöne Klangsphäre, begleiten die Jesus-Worte geschmackvoll, dezent und ausgewogen." "Belegt die Bandbreite der Schütz'schen Klangsprache sehr schön." "Singing and instrumental playing of great refinement and expressive intensity ... highly recommended." "Hillier, soloist Adam Riis, and the vocalists and players from the Ars Nova Copenhagen Schütz project are simply perfect." "The performance of the Johannes-Passion here is exceptional. [...] with an emphasis on the sweetness of the solo voices and a gentle grouping of low instruments." "Deeply moving performances of some intriguing works." Evangelist. Und es war um die dritte Stunde 1:02 6,40 kr. Evangelist. Es stund aber bei dem Kreuze 2:23 6,40 kr. Evangelist. Aber der Übelthäter einer 2:58 6,40 kr. Evangelist. Und um die neunte Stunde 2:20 6,40 kr. Evangelist. Darnach, als Jesus wußte 0:50 6,40 kr. Evangelist. Und einer aus den Kriegesknechten 1:23 6,40 kr. Evangelist. Und abermal rief Jesus laut 1:52 6,40 kr. Evangelist. Da Jesus solches geredet hatte 4:28 6,40 kr. Evangelist. Die Schar aber und der Oberhauptmann 5:36 9,60 kr. Evangelist. Da fürten sie Jesum von Kaipha 6:23 9,60 kr. Evangelist. Da nahm Pilatus Jesum 2:14 6,40 kr. Evangelist. Da ihn die Hohenpriester und die Diener sahen 6:21 9,60 kr. Evangelist. Sie nahmen aber Jesum 8:59 9,60 kr. Schütz never published Die Sieben Wortte unsers lieben Erlösers und Seeligmachers Jesu Christi\ as he did his Resurrection and Christmas Historias, and the work is known only in a set of performing parts whose connection to the composer is uncertain. We do not know whether the piece was intended for liturgical use in Dresden (though this is possible), and our only clue to its date is an inventory of music once found in Naumburg that evidently cites the piece; if the work listed is indeed Schütz's setting then the piece must have been composed before 1657/8, when the inventory was compiled. We do not know exactly how Schütz expected the work to be presented; the surviving set of performing parts represents one realization of the piece from the 17th century, but presumably was not the only possibility. The text of the Seven Words deals with the passion story but it is not a narration of the crucifixion, nor does it present only one of the four gospels. Rather it is a compilation of Jesus' utterances from the cross drawn from all four evangelists, sometimes quoted one at a time and sometimes in combination. Each of the "words" has the same structure: Narrative material in the voice of an evangelist introduces the words of Jesus' direct speech, which are the high points of each section. (The second and last sections each add a brief narrative tag.) Schütz realized this structure musically by clearly distinguishing the two kinds of material, making an audible contrast between the narrated portion (evangelist) and the spoken words (Jesus). Schütz distinguishes the narration from the quoted words by vocal scoring. Jesus' words are sung by the same tenor voice throughout, whereas the words of the narrator are sung by various other voices: soprano, or alto, or another tenor, or (in two cases) by a four-voice ensemble. That is, the voice of Jesus is associated with a particular singer but that of the evangelist is passed among three different voices, and even entrusted to a four-voice ensemble for the fourth (central) word and the last one. The constantly-changing narrating voice is less dramatically realistic than in Schütz's passion settings, but the changes in narrator help distinguish sections of the piece, which are more episodic than dramatically continuous - more a series of tableaux than a sequence of events. Schütz also distinguishes the two kinds of text by musical style. The evangelist's words are presented primarily in narrative recitation that draws both on the traditional chanting of gospel texts and on theatrical recitative. The tendency towards recitation on one note over a static bass line is most clearly audible at the beginning of sections; as each develops, the narrator's vocal line tends to take more expressive turns. Jesus' words are set in a very different style entrusted to one singer in the texture of the modern vocal concerto, setting an expressive line against an independent basso continuo. The vocal lines in these sections, in contrast to the evangelist's recitation, are characterized by musical and textual repetition including so-called sequences, passages in which a small musical and textual idea is repeated successively at several pitch levels (rising or falling) for intensification. In fact, text repetition in the passages of direct speech, mostly absent in the narration, is among the most important differences and helps make the organization of the text clear. It also makes for some striking moments in which Schütz breaks the pattern and does allow some repetition of text in the narration. One is at the start of the fourth section, in which Schütz assigns the narration to four voices rather than one. Those voices repeat the words "schrei Jesus laut" (Jesus cried out) both within their own lines and between each other, greatly intensifying the description of the outcry. And repetition also surfaces in two passages of solo narration: at the words "alles vollbracht, alles vollbracht war" (that all, all was accomplished) in the fifth section, and "Und abermal rief Jesus laut, rief Jesus laut und sprach" (And Jesus cried out, cried out and said), which introduces Jesus' final words in the seventh section. These passages heighten the narration, transferring to it some of the expressive language otherwise reserved for direct speech. In addition to using word repetition, Schütz intensifies the words of Jesus by adding two high-range instruments that play along with the singer, sometimes in passages of brief imitation of the voice and sometimes in alternation with it. The four parts - two instrumental lines, the tenor voice of Jesus and the basso continuo - together form a complete harmonic ensemble that offers further contrast with the much plainer texture of one voice and continuo heard in most of the narration. The text of the third section presented a challenge to the distinction between narration and direct speech because it includes the words of the two criminals executed with Jesus. Their long passages of direct speech are set, like the surrounding narration, for voice and continuo - that is, texturally closer to narration than direct speech. But their musical style, including expressive repetition, mark them as directly-spoken words, like those of Jesus. The lack of the two instruments that constantly accompany Jesus' words distinguishes them, and the choice of alto and bass voices separate them from the narrator (soprano in this section) and from Jesus (tenor). The seven sections narrating and quoting the words are doubly framed. Immediately before and after is a brief expressive sinfonia in a five-part texture (the two instruments that accompany Jesus as well as three others heard only in these passages). This repeated sinfonia is framed, in turn, by 5-part vocal movements that combine all the voices (SATTB) used in the work. The texts of these sections are the opening and closing stanzas of a hymn, "Da Jesus an dem Kreuze stund," whose words have pre-Reformation origins and that appear both in Roman and Lutheran hymnals. Although there was a tune that had come to be associated with this hymn in the German Protestant tradition by the mid-17th century, Schütz does not use it, instead treating the text phrase by phrase in the manner of a motet. The stanzas serve the same function both in the original hymn and in Schütz's setting, for the inner verses of Johannes Böschenstein's nine-stanza chorale text paraphrase the seven words, one each in stanzas 2-8. So the opening verse's message, urging the listener to consider well Jesus' last words, is equally apt for Schütz's setting. The final stanza of the hymn (the closing text of Schütz's work) promises God's favor to those who reflect on the words. This surely points to the composer's goal: to offer up and frame the words in expressive ways, less for narration and drama than for contemplation and reflection. For his setting of the St. John Passion (as well as those of St. Luke and St. Matthew), Schütz chose an outline that was familiar to listeners and musicians of the time and evidently traditional for the Dresden court chapel: individual voices present the narration and the direct speech of most characters, and multiple voices sing the words of groups. But the styles Schütz used in this composition were far removed from the most characteristic feature of 17th-century music: the aim of moving the affections - stirring the emotions of the listener. In the case of a passion setting, the purpose was to move the devout listener to a particular reaction to the story and (according to Lutheran theology) towards a personal connection to it. In fact, Schütz was famous for his mastery of Italian ideals of expressive music. In solo song this meant operatic monody - an individual voice presenting heightened musical speech supported by basso continuo. In writing monody the composer controlled vocal range, harmonic relationship to the bass line, and other melodic features to express the text, also counting on a performer's dramatic abilities to move the listener. In polyphonic vocal music the expressive elements came from the introduction of dissonance between voices (and its resolution); from a wide range of text declamation from the slowly unfolding to the rhythmically percussive; and from the creation of the forward drive of harmony resulting from the combination of vocal lines over a well-directed bass line. But the musical types Schütz chose for his passion settings do not allow for this kind of expression either in the solo material or the choruses. The solo singing is modeled on the formulaic recitation of scriptural texts, favoring a melodic line that remains on the same pitch for many words in a row. It uses no basso continuo, its range is limited, and there is no text repetition (a device often employed in monody at particularly expressive moments). And for the settings of the words of groups Schütz uses essentially the inherited style of the sixteenth-century motet in which the contrapuntal relationship of the voices is more important than the expression of the words. This style is much better at laying out the grammatical structure of a text - its division into phrases - than at expressing its content, let alone moving the listener. Schütz does sharpen the narration of the passion story and intensify its presentation, but not by moving a listener's affections. Instead, the composer expresses the text by careful control of the hearer's progress through the narration, musically dividing the text into smaller units and guiding of the listener's path through the story. This allows him to focus attention on particular moments, actions and words of special theological significance. In the evangelist's narration, Schütz's principal tools are the choice of reciting pitch and the arrival on particular notes as resting places (cadence points). The composed narration, like the liturgical chant on which it is modeled, tends to recite on one note, inflecting the vocal line to demarcate phrases and clauses and eventually cadences at the end of sentences. Schütz carefully varies the reciting pitch and controls the strength of cadences to suggest a particular structure. This is well illustrated in the opening narrative. The evangelist begins on the pitch E and narrates "Da Jesus solches geredet hatte ging er hinaus mit seinen Jüngern" mostly on B natural, with an inflection in the middle; continues "über den Bach Kidron" still emphasizing B; then finishes the verse in a gradual descent back to the opening pitch (E) on the two phrases "da war ein Garte" and "darein ging Jesus und seine Jünger." The return to the opening note signals the close of a unit, and the recitation mostly on one pitch unifies the section, whose text sets the scene. Schütz clearly separates this from the next (and very different) text, "Judas aber, der ihn verriet ..." which recites on a different pitch, F; this lies an awkward musical distance from the previous reciting pitch, B, and contrasts Judas with Jesus and the other disciples. The narrator recits next on G ("denn Jesus versammlete sich oft ...") for the words that first introduce the element of conflict. The third verse, beginning "Da nun Judas zu sich genommen hatte die Schare" recites on yet a third pitch (A) as the text introduces the next event in the narrative. The beginning of the following verse ("Als nun Jesus wußte alles ...") recites on C, again distinguishing it. This segment of the narration is rounded off by the words "Judas aber, der ihn verriet ..." which cadences on the original opening pitch E, and when the narration continues - "Als nun Jesus zu ihnen sprach ..." - Schütz uses the same formula and recitation on B as in the opening, as if starting over, reciting on B and cadencing on E ("und fielen zu Boden"). The result of this construction (which is much easier to hear than to read about) is that Schütz guides the listener through the narrative, dividing sentences, verses and sections not just by inflecting the reciting note (as in the traditional liturgical formulas) but by moving the recitation onto various pitches (B to F to G to A to C and back to B) to give a sense of progression through the story and to shape larger sections. The structure guides the listener through the elements of the story; this is an indirect kind of expression but an effective one nonetheless. The various reciting pitches in slightly different parts of a singer's range also give the performer scope for a more expressive delivery of the text than recitation on one note would allow. In the ensemble pieces that present the words of groups Schütz similarly structures text and music within the inherent neutrality of the unaccompanied polyphonic style he chooses. Almost all of the choral utterances are imitative, with successive entrances of the four voices (or of pairs of voices). The choice of imitative textures highlights the multiple voices in these passages in contrast to the single voices of individuals and of the narrator. To the extent that John's gospel recounts a large number of agitated words of groups (a feature with some troubling implications, particularly for the depictions of the Jews), the repetition of words from voice to voice adds a degree of urgency, as well as obviously emphasizing the words of witnesses to and participants in the narrative with whom listeners are perhaps meant to identify. There is also a great deal of word repetition even within each vocal line; Schütz extends most of the choral passages by repeating musical ideas and the text they carry. He also breaks up the longer texts into small grammatical units, giving each its own musical idea. Once again, Schütz guides the listener through each phrase of the text, here by segmentation, imitation, and repetition. He also introduces a greater variety of text declamation than is found in classical polyphonic models, using shorter or longer note values to set various phrases of text; this often has the effect of highlighting particular phrases, particularly in more active (faster) choruses. The techniques are illustrated in the chorus "Wäre dieser nicht ein Übeltäter, wir hätten dir ihn nicht überantwortet." Schütz divides the text into three units, devoting a new musical idea to each. The first ("Wäre dieser nicht ein Übeltäter") is declaimed at moderate speed among the four voices in imitation, with a pause in the middle that emphasizes the word "nicht." The next text segment ("wir hätten dir ihn nicht") is declaimed in quicker notes. Most of the voices repeat this text, adding to the urgency; and successive statements (in soprano, tenor, soprano and bass) are on rising pitches (E-F-G-A) with a similar effect. The series of strong arrivals on the word "nicht" in this section points up the grammatical parallel with the first textual phrase; together these settings emphasize the strange conditional statement attributed to the Jews ("If he were not . . we would not have ..."). Schütz finally reaches the last word, "überantwortet," the culminating and dramatically most important element that identifies the group's action; this he presents in a drawn-out setting that contrasts with the syllable-by-syllable declamation of the previous two phrases. Here the German grammar (which pushes this verb to the end of the sentence) works in Schütz's favor, allowing him to emphasize the word by making its musical setting drive towards a musical conclusion. In this kind of choral piece, as in the narrative recitation, Schütz is more concerned with the division and pacing of the text than with its overt emotional expression. But in a text as significant to the devout listener as the passion story, this is a powerful tool in his hands. Cover image: Karl Schmidt-Rottluff: St. Johannes (1912). Augustinus Fonden, Sonning-Fonden, and Etatsraad Georg Bestle og Hustrus Mindelegat.